On 1st November 2018, GigaDevice Semiconductor officially released the GD32E230 series of Arm® Cortex®-M23 based MCUs bringing designers the advantages of small size, low cost, energy-efficiency and flexibility; while supporting security extension requirements to run the latest embedded application solutions. As the first series of the GD32 MCU family based on the latest Cortex®-M23 core, the GD32E230 series MCUs are manufactured using the industry-leading 55nm low-power technology, focusing on ultra-low cost applications. With its small size and power efficiency, it can replace and enhance traditional 8-bit and 16-bit product solu-tions while delivering improved performance and power efficiency over the Arm® Cortex®-M0/M0+. The GD32E230 MCU series provide 18 product types, including package options of LQFP48, LQFP32, QFN32, QFN28, TSSOP20 and QFN20 with a chip dimension from 7x7mm to 3x3mm giving designers unprecedented flexibility to respond to the rapid development of smart application challenges. The series is presently sampling and will officially move to mass production this month. Arm® Cortex®-M23 is the successor of the Arm® Cortex®-M0 and Cortex®-M0+ which is based on the latest Arm®v8-M architecture of embedded microprocessor cores. It adopts a Von Neumann two-stage pipelined structure and supports the complete Arm®v8-M reference instruction set while maximizing code compactness. Moreover, it is compatible with all Arm®v6-M instructions allowing engineers to easily transfer code from Arm® Cortex®-M0/M0+ processors to the Arm® Cortex®-M23. Additionally, the new Arm® Cortex®-M23 core is equipped with independent resources such as single-cycle hardware multipliers, hardware dividers, hardware frequency dividers, nested vectored interrupt controllers (NVICs), enhancing debug er-ror correction and traceability for easier development. Subsequent products can also benefit from TrustZone® technology designed to support trusted and non-trusted software isolation and protection in hardware and to meet multiple security requirements. GD32E230 series products have a system frequency of up to 72MHz and are equipped with 16KB to 64KB of embedded flash memory and 4KB to 8KB of SRAM. While running under the highest frequency, they can achieve a working per-formance of 55DMIPS and their CoreMark® test score can reach up to 154 points. Compared to the same frequency on a similar Cortex®-M0 and Cortex®-M0+ products, the code execution efficiency of the Cortex®-M23 is 40% higher and 30% higher respectively. Not only does it have high-speed processing capacity, the new GD32E230 series products also provide many flexible interfaces to enhance connectivity. The chip is available with up to five 16-bit general- purpose timers, a 16-bit basic timer and a multi-channel controller, while the universal interface includes two USARTs, two SPIs, two I2Cs and an I2S. In addition, a 16-bit advanced timer that supports three-phase pulse width modulation PWM output and a Hall acquisition interface. For signal conditioning, a high-speed rail-to-rail input/output analog voltage comparator and a 12-bit 2.6MSPS sampling rate high performance ADC with multi-channel high-speed data acquisition to support mixed-signal processing for motor control and in-dustrial application requirements. GD32E230 is powered by a 1.8V-3.6V wide supply voltage and the I/O ports are 5V-tolerant. The newly designed voltage domain supports power management targeting powersaving and low power consumption for portable applications with three power saving modes. The maximum operating current is only 118μA/MHz with all peripherals enabled at full-speed operation mode. While in deep-sleep mode, the current is reduced by 86% and the standby current is only 0.7μA when the battery is used to power the RTC. It also has 6KV ESD protection and excellent electromagnetic compatibility (EMS) capabilities to meet most industrial grade, high reliability and temperature standards. It is suitable for industrial automation, motor control, LED display, household appliances and electronic toys, smart cities and smart homes, electronic payments, electric vehicles, drones, robots and other applications. Furthermore, it maintains compatibility of software code and hardware pins to the awarded GD32F130/150 and GD32F330/350 series MCU. This allows users to easily switch between wide ranges of GD32 entry-level products, in order to achieve their development aspirations with great flexibility and ease of use. GigaDevice is equipped with a complete set of development tools and learning kits for the new GD32E230 product. At the Electronica trade show to be held in Mu-nich, Germany, on 13-16 November 2018, located at booth B5-437, GigaDevice will also exhibit various MCU solutions related to the GD32E230 series of new products and industrial control applications. For more information, please visit the product website www.GD32MCU.com. 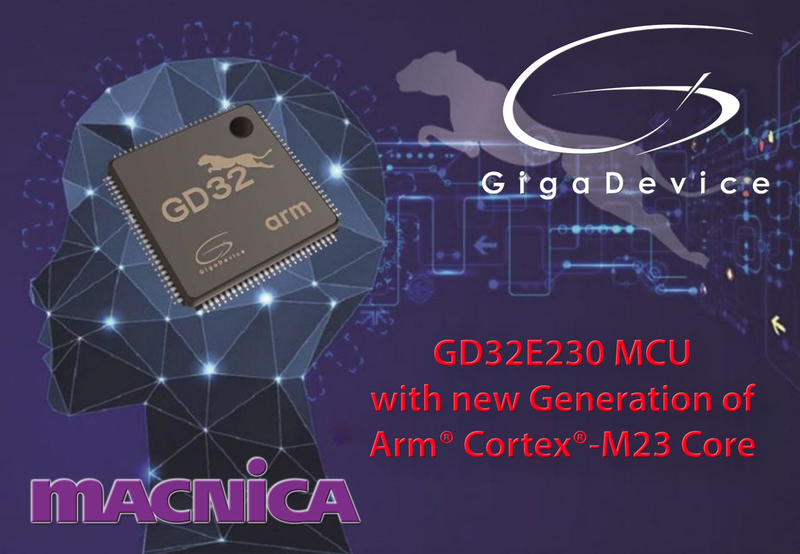 GigaDevice GD32 MCU is a leader in China’s high-performance 32-bit general-purpose microcontroller market being the first to release China’s Arm® Cortex®-M3, Cortex®-M4 and Cortex®-M23 core MCU product series. With a total of more than 200 million units shipped, more than 10,000 customers and 21 series with more than 320 part number selections, GigaDevice can provide solutions for a broad set of applications on the forefront of the market. GigaDevice GD32 MCU is also the first Chinese Arm® University Program (AUP) partner, an Arm® Mbed™ IoT platform eco-partner, and the title sponsor of the “GigaDevice Cup” in China Graduate Elec-tronic Design Contest. All models are compatible with each other in terms of software with scalable lines of hardware pin packages. They are fully applicable to all kinds of high-performance, mainstream and entry-level embedded control requirements; enabling cost-effective value while providing a comprehensive ecosystem and ease of use. With all this capability, these products have become the popular choice for system designs and project developments. GigaDevice, founded in Silicon Valley in 2005, is a leading fabless semiconductor company engaged in advanced memory technology and IC solutions. The company has global branch offices located in China, Taiwan, Korea, Japan, Singapore, United States and United Kingdom. GigaDevice provides a wide range of high-performance Flash memory and 32-bit general-purpose MCU products. It is among the companies that pioneered SPI NOR Flash memory and have powered more than 10 Billion elec-tronic devices since 2010. GigaDevice management system has achieved ISO 9001:2015 and ISO 14001:2015 certification. It is committed to the success of our customers through continuous innovation, in-depth research, quality design and de-velopment. The company is publicly trading on the Shanghai Stock Exchange since August 2016. For more information, please visit http://www.gigadevice.com/.